4-Word Review: Making a silent movie. The year is 1913 and Leo Harrigan (Ryan O’Neal) is tired of being a lawyer and representing sleazy clients, so by chance he gets a job writing scripts for silent movie mogul H.H. Cobb (Brian Keith). Later on he’s sent to California to direct his first silent film, but he has no experience doing that and finds that he has a rough relationship with the film’s leading man Buck Greenway (Burt Reynolds). It’s hard to know who to blame as both sides have differing accounts for what went wrong. David Begelman, the then head of Columbia Pictures, loved the script, which was written by W.D. Richter and had by all accounts a good dramatic edge to it, but when they gave it to Peter Bogdanovich to read he described it as a ‘piece of garbage’. Yet they decided to hire Bogdanovich to direct it anyways by promising him he could change the script any way he wanted as Begelman considered Bogdanovich to be a ‘cinematic genius’ and that ‘everything he touched turned to gold’. Bogdanovich on the other hand stated that he liked the script as it was, but was pressured by the studio to add in farcical elements as they were hoping to recreate the magic of his earlier film What’s Up Doc?. In either case the attempted comedy doesn’t work and the gags, which come at a rapid-fire pace, ultimately become more mind numbing than anything. The only funny bit is the extended fistfight between O’Neal and Reynolds while everything else sinks into mundane silliness. Supposedly some of the story is based on the real-life remembrances of film veterans Raoul Walsh and Allan Dwan, but with so much misguided zaniness thrown in it’s hard to know what if anything to take seriously. The story desperately needed more of a focus. Having it about a small cast and crew trying to make their first silent film and the many challenges that it would entail could’ve been both amusing and revealing, but the story jumps ahead too much. We see the characters in one setting at one moment and then on a whim the film fast forwards to them in some completely different setting a year or more later, which never allows the viewer to connect emotionally with the people or what they’re going through. O’ Neal is good playing a befuddled sort who simply reacts to the goofiness around him while Reynolds is excellent as the rough and tough good ole boy and their budding love/hate friendship should’ve been the film’s main focus. Supermodel Jane Hitchcock, in her one and only feature film appearance, is easy on the eyes, but her part was originally intended for Cybill Shepherd, who would’ve given the role more edge. The cinematography by Laszlo Kovacs is pristine as is the period detail, but the story takes on too much especially the second hour, which just goes from one tangent to another. 4-Word Review: Searching for client’s daughter. Leslie C. Tucker (Michael Caine) is a British private eye working in L.A. who gets hired on by an eccentric client named Anglich (Michael Constantine) to find his long lost daughter that was born 24 years ago and now resides he believes somewhere in Hollywood. Tucker tries following the skimpy clues and this leads him to a beautiful woman named Ellen (Natalie Wood) who he believes just may be that daughter and not even know it, but the closer he gets to some answers the more questions he has to tackle as well as being chased by a pair of hoods (Timothy Carey, Don Calfa) who are out to stop him. This film is based on a novel by Keith Laumer with a screenplay written by W.D. Richter and directed by Peter Hyams. With such talented people involved you’d think this would’ve been a winner, but it bombed at the box office and I’m not completely sure why. The ingredients are there, but the oversaturation of private eye parodies during the ‘70s could’ve gotten this one lost in the shuffle. The film though is filled with snappy dialogue and some highly amusing voice-over narration by the Tucker character. There are also unique scenes including a car chase that takes place amidst a major traffic jam and a cool foot chase sequence down a long, winding spiral staircase. I also loved the scene where Tucker is trapped in a car with an angry dog outside only for him to miraculously turn-the-tables on the animal where he gets outside while the dog ends up stuck in the vehicle. The best moment though is at the beginning when actor Guy Marks does his impersonation of Humphrey Bogart while standing in a dark alley and reciting the opening credits instead of having them shown on screen. As much as I love Michael Caine I found him to be wrong for this role. If you’re going to do a light parody of old school private eye films then you have to cast someone in the lead that would reflect to some degree Bogart. It certainly doesn’t have to be an impersonator, but someone that is from Brooklyn and has a New York mentality as opposed to a transplanted Englishman with a British accent. Wood is equally miscast. This was her first theatrical feature in 7 years and she turned down a role in The Towering Inferno to do this one and I’m not sure why. The part is rather small and offers little range in either acting or character development and with everything else that goes on in the story she ends up getting forgotten though it does have a foreboding quality in that the final segment involves her on a boat and near water. The mystery itself ends up being the worst thing. It’s too intricate and filled with so many rapidly paced twists that it becomes almost impossible to follow. The action is enough to keep it interesting, but as a compelling plot it fails. I also wasn’t too crazy about the title. The working title was ‘Fat Chance’, which I didn’t like either, but peeper is slang for a private eye who takes a lot of photographs, which this detective doesn’t do at all. 4-Word Review: This thing is weird. Buckaroo Banzai (Peter Weller) is part-time rock band singer who has invented a mechanism that he calls the oscillation overthruster that allows him to travel through rocks and other solid matter. He is somehow able to do this by tapping into the realms of the 8th dimension, but upon doing so he also attracts the attention of some aliens lead by Lord John Whorfin (Jon Lithgow) who wants to steal the device and use it for their own nefarious needs. 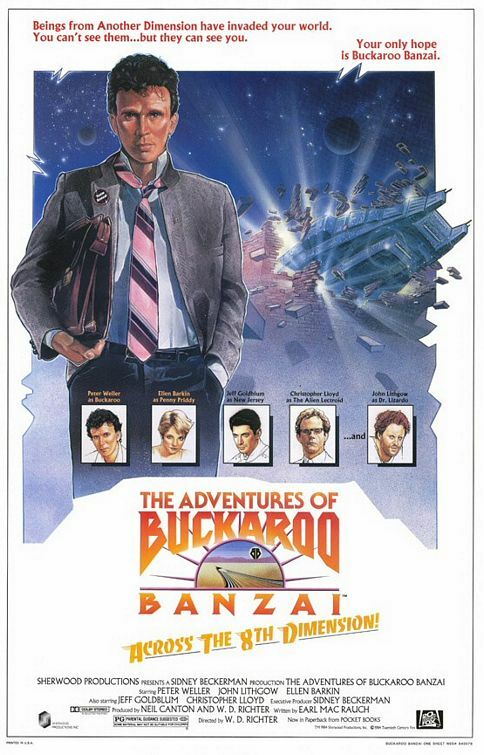 Buckaroo, who is able to recognize these aliens who otherwise look human to everyone else after being zapped by some electronic component through a telephone receiver by a group of other aliens, gets a group of fellow geeks together to help fight the evil Whorfin and his men before it is too late. In a lot of ways this film is a refreshing change-of-pace and it is not surprising that it has attained such a strong cult following. Most films with such an offbeat concept end up selling out and becoming quite formulaic and conventional with only a few odd elements thrown in for good measure, but this movie is completely weird in all facets and truly lives up to its campy over-the-top title. I loved the off-the-wall banter, ridiculously silly, but still quite entertaining special effects and characters that are uniformly warped. The comic book look is great and the story gets increasingly more absurd as it goes along. You have to tune out your logic and conventional movie mode to get into this and enjoy it, but the humor and chuckles are there if you let it. Unfortunately the pace as well as the beginning become a bit too off. I found things to be completely confusing at the start that I really couldn’t understand what was going on for the whole first half-hour. The film seemed to jump from one outlandish scene and character to the next without any cohesion and the result was quite off-putting. It wasn’t until about 45 minutes in that I was able to finally get into the groove with it, but more of a background to the characters and a set-up would have helped greatly. There are still enough memorably unique moments to make it worth it including my favorite the Banzai Team March, which was filmed at the Sepulveda Dam in the San Fernando Valley and shown over the closing credits. Weller is in fine form in the lead and seems much more at ease with this role than he was in Robocop where he came off as being miscast. Lithgow is a hoot as an over-the-top villain speaking with a heavy Russian/German accent. I also enjoyed Matt Clark as the Secretary of Defense who acts as if he is above all rules of protocol until finally being put into his place by a little kid with a rifle. The closing credits listed a follow-up title that was supposedly going to be a sequel that unfortunately was never made due to the film’s production company going out of business, which is a shame as this thing had strong potential of becoming a major franchise. W.D. Richter who has an impressive screenwriting resume does well in his directorial debut and it’s an equal shame that he only helmed one other movie at this point as he shows potential to being uniquely talented in that position.